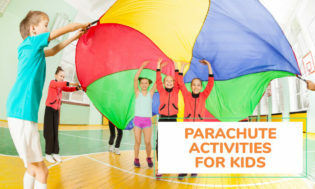 Parachute games are a great way to entertain and provide exercise to children of all ages. These 31 games and activities are sure to do just that. 1. MUSHROOM–A GOOD WAY TO INTRODUCE THE PARACHUTE! 1. Children evenly spread out in a circle –while holding the edge. 2. Pull the parachute taut and then lower it between knee level and the ground. Tip #1: to get it as high as possible, all participants take a couple steps towards the center as the chute rises. Tip #2: Practice together so the children can learn cooperation and working together as a group. 2. VARIATION OF MUSHROOM: Once the basic play is mastered, experiment! 1. Mushroom and then all children runs to the center while still holding the chute. 2. Mushroom and then have all chidren let go of the chute at exactly the same time. If there isn’t any wind, the chute will retain its perfect puff shape and rise straight up into the air. This is especially fun outdoors on a windy day. Indoors it may go up to the ceiling. Place a variety of ‘treasures’ (anything you want) into a treasure box under the parachute. Make waves (above) as if in a Sea Storm. Send divers to retrieve called out items one by one from the box. Lift the parachute high overhead. 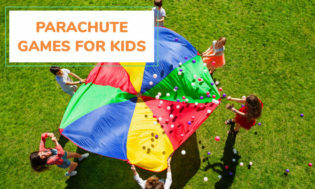 Call one child’s name and have him/her run to the other side before the parachute comes down and tags them. Variation: You can alter the game by having children skip, crawl or twirl to the other side. 1. Have each child hold the parachute with one hand-with the opposite arm extended straight out for balance. 2. Run clockwise in one direction and then change to counter clock . Tip: Use music to cue children for changing direction; every time the music stops, direction is changed. You need a large parachute for this activity. Depending on the amount of children playing, going around the circle, number the children. Example: 1-2-3-4-5, 1-2-3-4-5, etc. Call a number such as “3” and all the “3’s” switch places by running under the chute. Loud with running excitement but fun! Number around the circle 1 or 6 (or adapt numbers according to group size). All the number one children remove a shoe and throw it under the parachute. On the third lift–all those missing a shoe go into the middle, retrieve their shoe and return to their place. Continue with the other numbers! Have all the players hold the parachute way up high above their heads. Call out two names and have these two players run underneath the parachute, shake hands, then run back out before the parachute comes down. Continue doing this until all the players have had a chance to run under the parachute. Try to keep the parachute floating as long as possible. Each player is given the name of a fruit such as pear, apple, or strawberry. When the facilitator calls out the name of a fruit, everyone with that fruit name changes places by running under the parachute. When fruit salad is called out, everyone must swap places with the players on the other side. 1. Have children hold the edtges of the parachute-with one child sitting under it. 2. On signal, the children pull back and forth on the parachute as if they are washing hair. 3. The child’s hair beneath the parachute becomes statically charged because of the rubbing. 5. The more often the hair is “washed”–the more ‘charged’ the head of hair becomes. Holding onto the parachute, children walk around in a circle. Variation: Add to the fun and change the action words to-skip,hop, run, etc. As the song is sung, have children raise the parachute above their heads. Start with all players holding the chute stretched out. Throw as many soft balls as you have onto the chute-the more the better! Holding the chute tightly, have children bounce the popcorn (balls) as quickly as they can off of the chute. Variation: Play this game in two teams. One side of children try to bounce the balls off the chute, while the other side works at keeping the balls on the chute! Place a number of beanbags or cotton balls on the chute. Shake the chute to make them rise like popcorn. Variation: IN THE WINTER USE COTTON BALL AND CALL IT ‘FALLING SNOW”. Have the children try to roll balls into the hole in the center of the parachute. Place a soft ball of any size in the center. The object of the game is for each team NOT to let the ball fall off on their side. Have all players holds the chute stretched tightly. Place a large ball near the edge. The object of this game is to try to make the ball roll around the edge of the chute. To do this someone starts the ball rolling. As it comes towards you, you lower the edge you are holding, and as it goes past you raise your edge. When all the players do this smoothly, a wave is created that goes round the edge, pushing the ball in a steady circle. It can not be done without concentration and co-operation! Tip:This game also needs practice and co-operation. When mastered it can be a lot of fun! Hyou’ve done this try speeding up – or change direction. Variation: Roll the ball at different speeds or change direction. Place a ball on top of the parachute and have the players roll the ball back and forth to each other. For example, you could tell a specific person to roll the ball to someone that you name. This game encourages cooperation, as the players will have to work together for the first player to get the ball to their friend. Place a ball on the parachute and catapult it as high as possible! While the players are holding onto the parachute, place several balloons on top of the parachute. Count to 3 and then say “up”. On the word “up”, all the players raise the parachute up over their heads as fast as they can and then bring the parachute down as quickly as possible. Where are the balloons? Keep repeating this game to see how high you can get the balloons to go, or how far you can get them to travel. 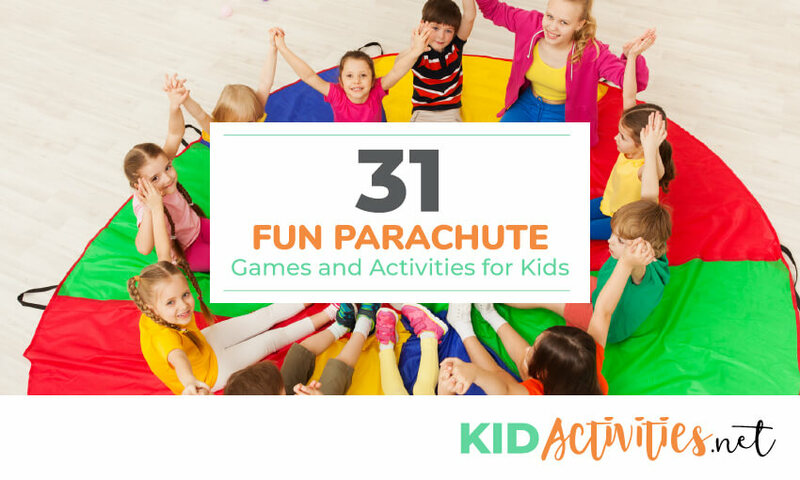 While the players are holding onto the parachute, toss a plastic golf ball onto the parachute. Have the players manuever the parachute to try to get the ball through the hole. When the ball is in the hole, have a caddy go under the parachute to retrieve it and start over. Count the number of waves (golf strokes) it takes the players to get the ball into the hole. Keep track on a scoreboard. Put the fleas (balls) on the parachute and challenge players try to get the fleas to jump higher and higher. The fleas are successfully taken care of at the end of the game– when they land outside the parachute! Put various sized pompoms in the top of the parachute and try to get them into the middle pocket. Variety: form teams with different colors of pom-poms and challenge them to see which team can get the most of their color into the middle pocket in an alloted time. Place four to six skipping ropes on the chute. By shaking the chute, the children try to shake them off. 1. Start off on the floor with all children sitting calmly and grasping the parachute-this is a gentle breeze. 2. Pretend that it starts raining. As it rains have the children stand. 3. Oh-oh…the rain is now turning into a THUNDERSTORM! All children start shaking the chute as hard as they can to simulate the storm. Always be sure to check the ground underneath the chute.Outdoors, dry grass is the best play surface. Wet grass can be slippery. Space children and adults evenly around the edge of the chute. Before play review parachute rules. Remind children to play safely– to listen to instructions– and not bump heads or run into each other. When facilitating play, a second adult is helpful in fielding children and balls, etc. A parachute is best stored by taking hold of the center in one hand and then twisting the chute loosely into a rope. Roll it up and stuff it into a bag/sack. The thin nylon sacks sold for the storage of sleeping bags work well.